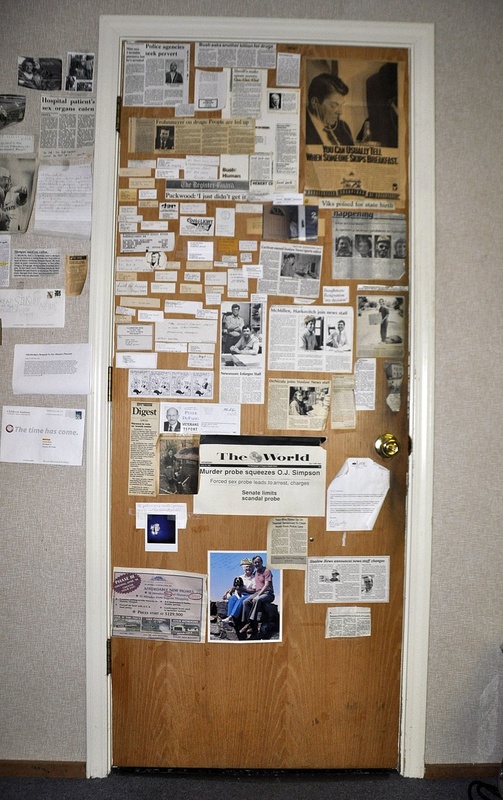 The Door (of Shame, Blame and Brilliance): Sentinel of journalistic history and guardian of our commode since 1971. There’s no need to rub your eyes or splash cold water on your face! And you, the one banging your head with a ream of copy paper: Stop that. What you’re seeing is REAL. As you’ve probably guessed by now, each of these incredibly strict criteria has been met! (And if you haven’t guessed that by now, a position in Walmart security is waiting for you.) What this means is that we will be participating in an extremely rare induction ceremony for The Door, which hasn’t occurred since running out of glue sticks and adhesives in the mid 1980s. The Door is a beacon, drawing us into the jagged rocks of journalism. Okay, you can let go now; sorry my hands were sweaty. I’m not sure if it was intentional, but this article doesn’t talk as much about Sam Briseno’s art as it does about it’s enormous size. Fine. Maybe it’s just me. But I’m feeling a little inadequate right now. Speaking of which, before our next entry, I should begin by saying everyone makes mistakes — even ME. No, it’s TRUE! (Next time, please try to act more surprised.) 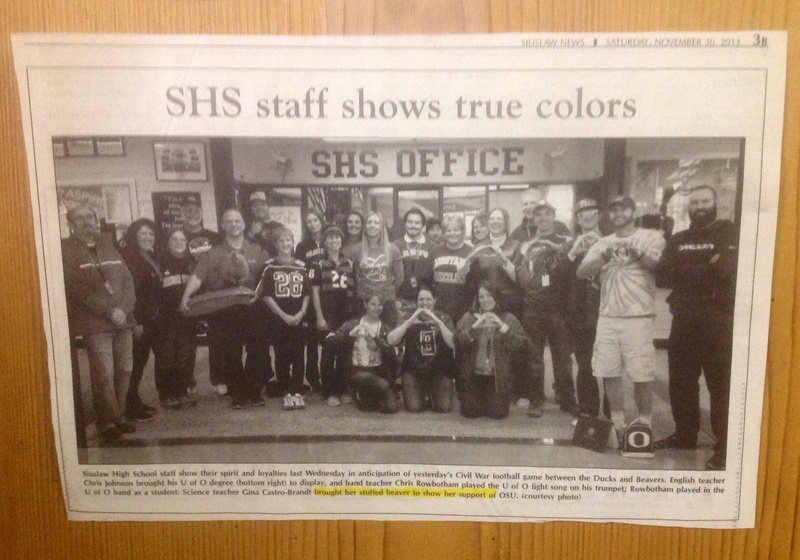 For this reason, I am submitting a photo that recently appeared here in Siuslaw News, on a page I worked on. 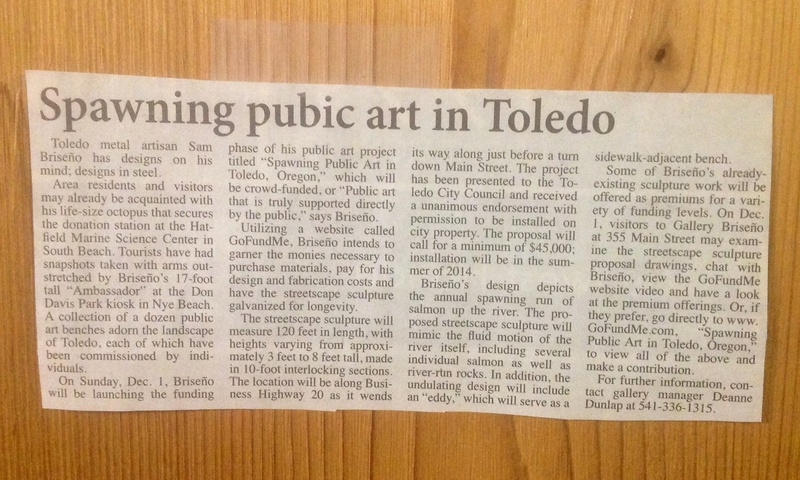 In my defense, the photo and cutline were submitted to us. However, given my years of journalistic experience, and factoring in a natural thought process my wife has referred to as “naughty,” I really should have caught that before it went to print. These are awesome! Would love to see more from the earlier days. I read some of my old crap yesterday and immediately crawled into fetal position from the embarassment. It’s so blame and shame-laden and riddled with horrible cliches, that it’s not even worthy for your Door. I keep those snippets around just to remind myself that even though I play a writer on TV, I’m not one in real life! Thanks, Michelle 😉 If you get bored, you can click on the gold “The Door” link in the post and it will take you to the archives for that feature. Some of the things that newspapers miss are a mixture of hilarity and horror. And don’t kid yourself; you don’t “play” at being a writer — you IS one. Now take a nap or something and get better! Personally, I like that the photo of the group showing their “true colors” is in black and white. I imagine you were.. ummm.. pelted with letters regarding the beaver cutline, which I think it’s appropriate to be called a cutline….. Your wife isn’t going to let me come over to play any more. HEY!! I wear the PANTS in this family!! The beaver! Symbol of the great nation of Canada! The beaver! A reclusive creature whose thick, luxurious fur protects it from the ravages of subarctic winter. The typical Brazilian would freeze to death up here. The beaver! Almost hunted to death by outdoorsy men from Europe who spent long periods of time without seeing women. The beaver! Proudly displayed across from the Queen’s head on the Canadian nickel. The beaver! No Canadian home is complete without one. What is it like in the news room the morning after something like this happens. Rubbing from the other writers. OK Tom and Ned…really? Beavers pounding…rubbing from the other writers? Your wife was write. You are naturally naughty. Only if you get rid of the stuffed fighting Irishman. so good and i thought pubic art had to do with manscaping? I’ll try and finish this later when I’m more psyched up for the horrors within. That’s the thing. “Spawn” is just the wrong verb here. Wrong, wrong, wrong. Is it me or is there something about having a dead, stuffed and mounted version of your favorite team’s mascot on the mantle above your fireplace that is just kinda counterproductive to cheering the team on? I mean wouldn’t it make more sense to have a dead, stuffed and mounted version of the team you hate mascot on your mantle? That’s why I have an actual Fighting Irishman – formerly fighting I suppose – and Trojan – old time one…you know inside the horse…not the condom. Couldn’t fit the horse on the shelf. Shame. I’ve always thought the same thing. About not having a stuffed condom on the shelf, I mean — unless you’re rooting for the Fighting Bobbitts. But I also agree with the mixed message that stuffing your mascot and having it on display sends. It’s one of the reasons I won’t go into the home of a Redskins fan. Aaaah hahahah I thought “galvanized for longevity” was funny until I read about Gina’s stuffed beaver. For obvious reasons, that ‘stuffed beaver’ struck a chord with me on numerous levels. I was really hoping you wouldn’t see that, Lester. Would it help if I told you it was road kill before it was stuffed? Well, I just report the news; I don’t make it. And any documentation proving otherwise has been destroyed. So their true colors are halftone? Maybe something akin to shades of grey? Possibly 50? Yes, but don’t let E.L. James know.